After their exciting round 18 victory at Suncorp Stadium, the Warriors were back at Mount Smart to face the Melbourne Storm. 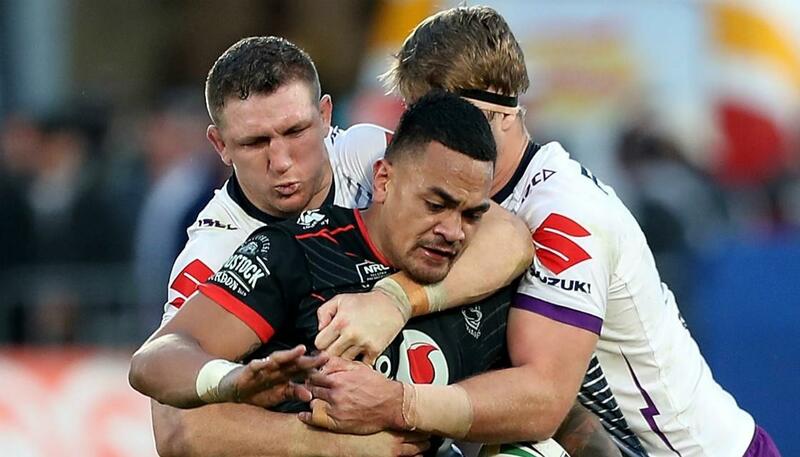 After the embarrassment of the Anzac day clash, the Warriors were looking for revenge, but it was not to be as they lost a much closer battle 12-6. What a tight game this was, the Warriors showed more spirit in this match than they did in their round 8 encounters against the Storm. Unfortunately, the Warriors lacked the execution that you need when you play a side like Melbourne, a large part of this I believe was due to the late withdrawal of Blake Green. Blake has been integral in leading this Warriors team around the park and in his absence. I don't believe that Shaun Johnson and Mason Lino were up to the task in this match, making some questionable choices and not trying to settle the side down when time was running out, cool heads needed to prevail, and it felt like the team was panicking and just throwing the ball around without thought. It wasn't all bad by any means which leads me to my positives. The Warriors defensive effort improved in this performance, still too many missed tackles for my liking, but there weren't too many areas of the defensive line that the Storm could target. Gerard Beale is adding some much-needed structure on the right edge, but if I could nitpick one thing, it would be Solomona Kata's desire to rush out of the defensive line nearly everytime the Storm ran his way. Paasi shined once again with another strong performance. Unfortunately, Stephen Kearney forgot that he was in the side and only gave him 41 minutes in this match. I firmly believe that if Paasi were given more minutes, the Warriors would have won this matchup. He fights for every metre and is always a nuisance defensively. He can play more minutes as he showed last week so they should be using him more. Lastly, the Warriors did not give up in this match, even in the dying stages of the game they were still pushing the Storm to the limit, but they were just unable to finish their opportunities. It's a learning lesson for the Warriors and a close hard fought match like this is perfect when it comes to preparing for finals football, and I think with Blake Green back the Warriors will have a better chance of converting their opportunities into points and ultimately getting them the win. There were still areas of concern though which leads me to my negatives. First up the referees were not up to scratch not only in this match but in several this round. In this match however they missed forward passes for both sides, and Cameron Smith's high shot on Ken Maumalo was impossible to miss yet for some reason they missed it. The NRL need to do something about the poor performances from the referees as it really makes the games frustrating to watch. Don't get me wrong the Referees were not the reason that the Warriors lost this match I just want some accountability if the officials perform poorly. Stephen Kearney still seems unable to effectively use his interchange, with Peta Hiku's injury during the week we finally have three forwards on the bench, but he just left his players off the field for too long. At one stage Kearney had Simon Mannering, James Gavet and Agnatius Paasi all sitting on the bench, against the Storm you cannot keep players like that on the bench for as long as Stephen did, im hopeful that one day he will get it but it most likely won't be this season. My last negative is the lack of execution. Shaun Johnson and Mason Lino did not mesh, and neither player seemed to put there hand up to lead the team. It's no secret that Shaun performs better when he doesn't have the pressure on him to steer the ship but with Mason joining him in the halves he really needed to step up, and he just didn't deliver. Several times throughout this match they both looked lost and made silly decisions, the play that sticks out in my mind was when Mason put a grubber through for himself on the 2nd tackle when he had a two-man overlap on his outside. All this will be fine if Blake returns next week but if he doesn't Shaun needs to step up. My Warrior of the game goes to Ken Maumalo. Ken continues to impress me each and every week; it's hard to believe that this is the same player that couldn't seem to hold onto the ball last season. His runs are critical to the Warriors performances every week, and it's a joy watching him when he makes a break. He still has a lot of room to develop, and I believe the best is yet to come from big Ken. 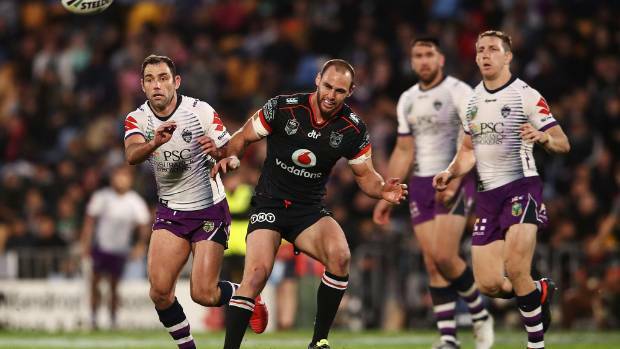 My Warrior to improve is Simon Mannering. After announcing his retirement during the week, I thought a weight would be lifted from his shoulders, but this week he seemed to make a lot of errors that he wouldn't usually do. He was off on his passing game and tried to offload when it wasn't on. I think it may have been more a fact that Simon was trying too hard and it just wasn't working. I firmly believe that this was a blip, Simon will bounce back strong as he nears his 300th game and will finish his career off with much better performances. Round 20 has the Warriors heading back across the ditch to face the Gold Coast Titans. The Titans have been the Warriors whipping boys for the past few seasons, and I feel that this trend will continue with the Warriors winning this match by 12. With the ladder as congested as it is the Warriors really need to get a big win here to improve their points differential. There is still a buffer between 8th and 9th place, but the Warriors need to add to their win tally to keep themselves comfortably in playoff contention. Blake Green and Issac Luke should both return this round, but Adam Blair has been cited and will miss one game if he pleads guilty and two weeks if he fights it and loses. If it were me I would take the guilty plea as missing the match against the Dragons is too big a risk. Pulu will most likely return to the side in Blair's place after a strong return in reserve grade this week. So that was my take on a deflating round 19, but as usual, I will leave you with some questions. Do you think that the Cameron Smith high shot should have been a penalty? Who was your Warrior to improve? Would you rush Pulu back into the side? What is your score prediction for Round 20?